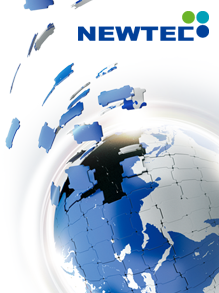 We, Newtec Co., Ltd. is one of enterprises leading the mechanization of aquaculture industry in Korea. As the specialized enterprise, Newtec focusing on the field of mechanization of aquaculture industry only for more than 20 years by starting as the individual enterprise in 1992, major products are the crane to be installed in the working boat of aquaculture, the multipurpose jib crane to be installed in the coast and the FRP working boat for the aquaculture, etc. The aquaculture of abalone, etc. by the early 2000 has been dependented on the manpower in case of Korea. There was having some problems as follows since the collection of food as seaweed or kelp, etc. • The earning deterioration to the increasing personnel expenses. • The abandonment of aquaculture to the aging of aquaculturist. • The limit of aquaculture size enlargement and the deterioration of productivity. Newtec Co., Ltd. started to supply the crane for working ship of aquaculture, the specialized FRP working boat for aquacuture working and the jib crane, etc. for lifting the working boat or aquatic products by developing those from 2004 to solve these structural problems. The abalone aquaculture industry of Korea was attaining the explosive growth and the qualitative development for more than 10 years since then, Newtec Co., Ltd. has done the decisive contribution to here. The scale of abalone aquaculture per one household which was nothing more than 100~200 cages before the Newtec’s crane is supplied has been expanded to 500~2000 cages, the increase in the production volume of 6 times with 6,200 tons of abalone output in 2009 has been achieved whereas it was nothing more than 1,065 tons in 2003. Newtec Co., Ltd. acquired the certification of quality management system (ISO9001) and the environmental management system (ISO14001) from the global certification authorities as a result of ceaseless research and development, acquired the certification such as the acquisition of venture business, the technological innovation form business (Inno-Biz) and the management innovation form business(Main-biz), etc. from Korean Government. Newtec Co., Ltd. would strive to concentrate on the further research and development to have the capability as the global business, would put more effort to understand the characteristic of aquaculture and the needs of customer by each country accurately. Also, We want to do our utmost always so that it may be the business giving the impression to clients with the best quality, the optimum products reflecting the needs of clients.